As you know, I am a huge fan of French Meadow. Their menu incorporating all types of dietary needs was a lifesaver for me when I was a vegan and in a food rut. 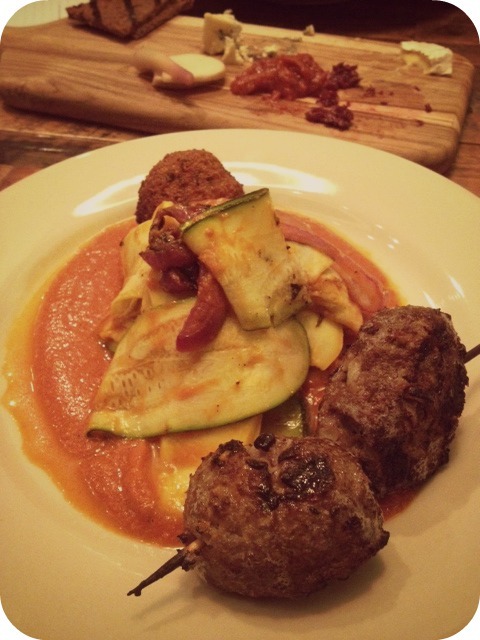 French Meadow makes amazing food for those who have dietary restrictions but without sacrificing taste. I didn’t think French Meadow could get any better but it has. Expanding their location on Lyndale Avenue, French Meadow opened a wine bar called Bluestem Bar and Table. If you are a fan of French Meadow you will love Bluestem. They have an excellent menu with items that range from salads to burgers to pasta. I always suggest eating off of the specials menu. 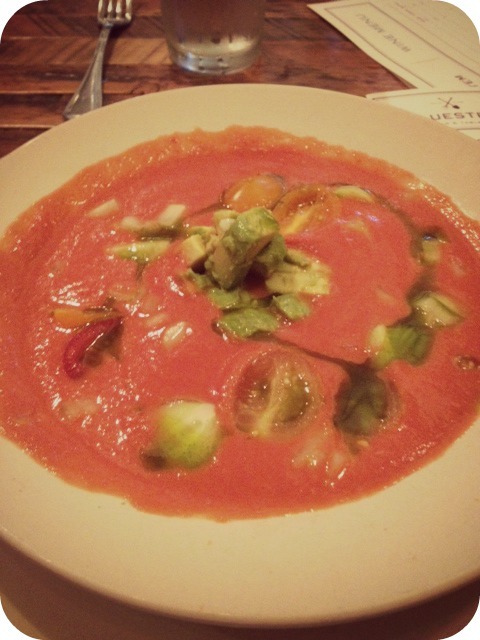 When I went to visit it was a very hot day and the tomato gazpacho that was on the specials menu was perfect. Gazpacho is a cold soup and although it is very different from eating warm soup, if done right it is wonderful on a warm day and still has all the flavor that you need. 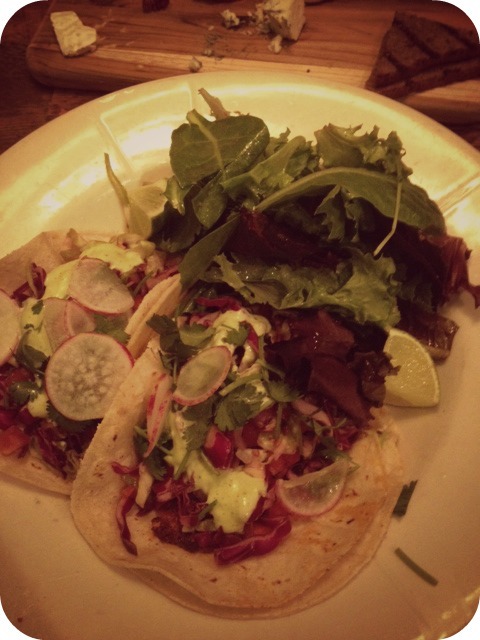 Other highlights from the menu are the fish tacos, raw kale salad, harissa chicken, and the beet carpaccio salad. If you are eating with a slightly picky eater they still have your basic hamburger or chicken and waffles as well. I was very impressed by the wine menu. Absolutely get the first flight of Rose. As someone who is not usually a Rose person, this flight caught my eye. This is not your grandmother’s Rose, it is much more flavorful. They also have a happy hour from Monday- Friday from 3-5 P.M. Also, a late night happy hour 10- close every night of the week. Although the happy hour menu is fairly small, they have mussels and the turkey burger for only 6 dollars each. Need somewhere to go for your birthday? 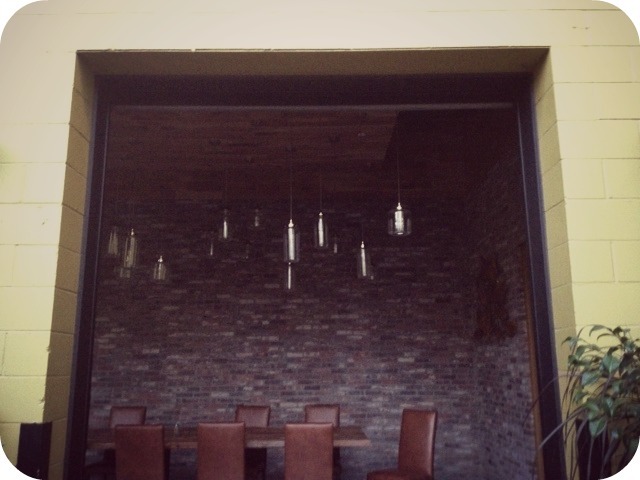 They have a few private dining options such as their tasting room which is a beautiful spot to host a party. As of right now, they have no minimums to rent the room, get in while you can. The other little secret that I will share with you is that you can make reservations at Bluestem for breakfast on the weekends. No more waiting in line or waiting for a table if you prepare ahead of time. They have the same breakfast menu as French Meadow but with service and reservations. I cannot wait to see what the future has to offer for this group of restaurants. They are living up to their values of offering good food that is local and organic. What is your favorite item on the Bluestem menu? Yum! I always get french medow when I’m flying, but I really should get the full experience sometime. Oh my gosh…. you have never been? You need to get there. The food is excellent and even better than when you can get at the airport. If you go for dinner they usually have candles on the table and it has a much different feeling than lunch or breakfast. Also don’t skip dessert. It is a must.